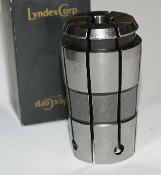 Products >> Lyndex TG100 Collet - 9/32"
Lyndex TG standard collets collapse approximately 1/64". 9/32" opening size, 2.386" length, 1.278" top diameter, 1.121" bottom diameter. Nut tightening torque: 75 feet pounds.